The beautiful Aguinid falls in Samboan are one of the best attractions on Cebu Island in the Philippines. This impressive natural wonder is fed by the Tangbo river, which gives the falls a slightly green colour due to the calcium rich water. With 8 different levels, the falls are a unique place to explore some truly magnificent nature. No description could do the stunning Aguinid falls complete justice, so it’s a worthy inclusion on any itinerary when visiting Cebu Island. It’s an easy day trip from Moalboal or Oslob, and can be combined with visiting Kawasan falls. 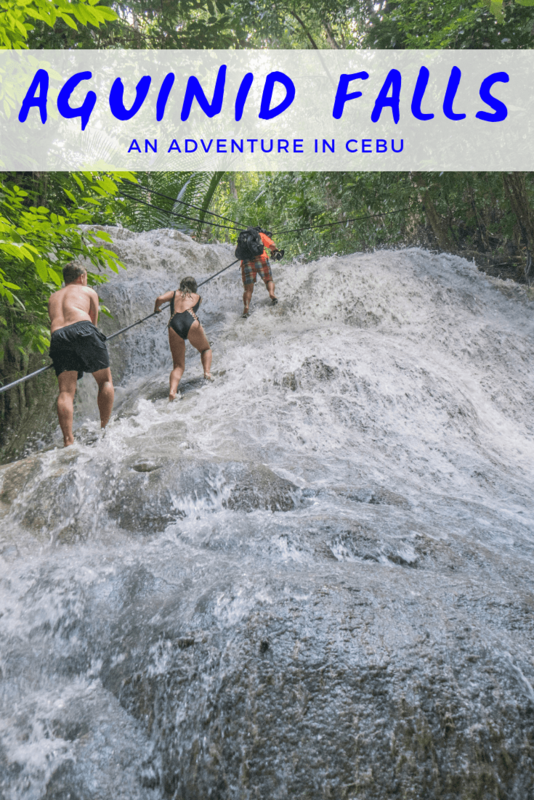 This travel guide covers everything you need to know for an adventure to Aguinid falls on Cebu Island. Make sure you don’t forget to pack the essentials with our guide of what to pack for the Philippines. It covers everything you need for visiting Aguinid falls and the rest of the country! Aguinid falls entrance fee – 60 pesos for foreigners, 40 pesos for locals. Aguinid falls height – Aguinid falls is made up of a series of waterfalls, with the highest single fall being around 30 metres. Cost of parking at Aguinid falls – 10-20 pesos depending on where you park. Due to the location of Aguinid falls in the south of Cebu Island, one of the best places to stay nearby is Oslob. The easiest way to reach the falls from Oslob is by renting a scooter/bike, which costs around 200-300 pesos per day. 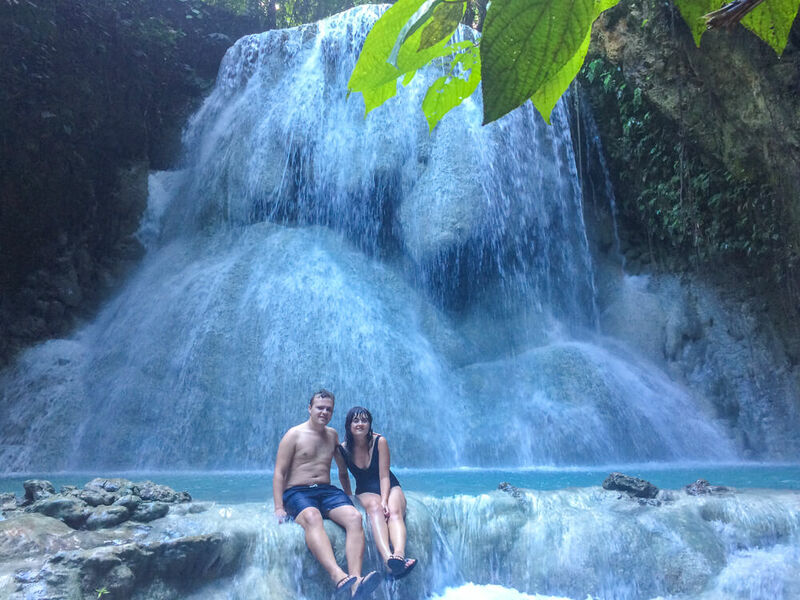 We recommend spending a day exploring the south of Cebu and going from Tumalog falls to Aguinid falls and Kawasan falls as part of your route! 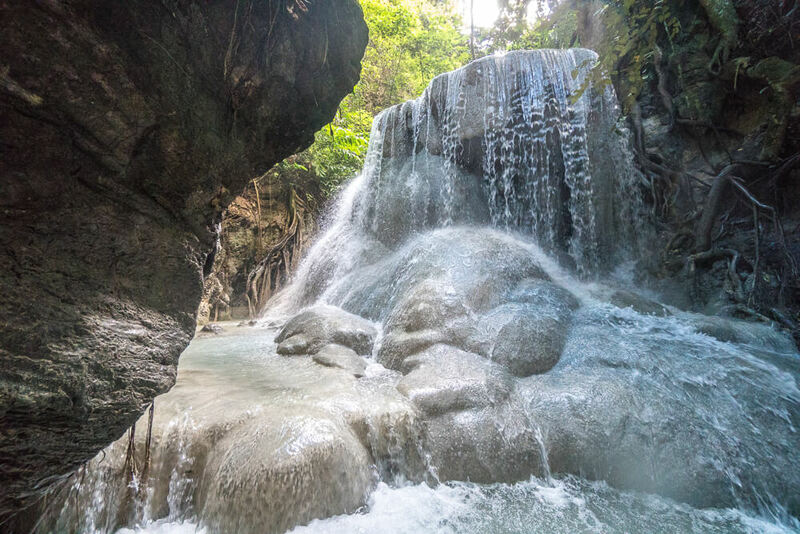 Tumalog falls is a towering waterfall in Oslob, while Kawasan falls is one of the most famous waterfalls in the Philippines. It’s worth noting that if you ride a scooter/bike without a proper license, then your travel insurance will be invalidated if you’re in an accident. Alternatively, you can reach the falls by bus. Take a bus south and tell them you’d like to go to Aguinid falls. You’ll reach a bus terminal at which point you’ll need to change bus and again state you’d like to go to Aguinid falls. This bus should drop you off near the entrance to the falls, with the total journey costing around 30 pesos. The final option is to take a habal habal (mototaxi) to the falls, which should cost around 500 pesos for a return trip. Getting to Aguinid falls from Moalboal is pretty simple, and can easily be done as part of a day trip including a stop at Kawasan falls. The easiest way to get to the falls from Moalboal is to rent a bike/scooter, which should cost around 200-300 pesos per day. To drive there just follow the main road on Cebu Island south, and use google maps or maps.me to figure out the exact location. It’s also possible to get to the falls from Moalboal by bus. Catch a bus heading towards Bato and ask to be dropped off at Aguinid falls. This should cost around 70 pesos, but may be slightly less as you aren’t going all the way to Bato. As Cebu City is 150 kilometres away from Aguinid falls, we recommend staying closer by in order to visit. That way you can arrive at an earlier time and hopefully avoid other tourists! If you do want to take a day trip from Cebu City then the best option is to hire a private van to take you. This can be organised online or by asking around in the city, and works out at a reasonable price if you’re travelling in a group. Once you arrive, you have to pay an entrance fee to access the falls, which is 60 pesos if you’re not Filipino. You will be asked to register and be assigned 2 guides to lead your group through the different levels of the falls. Guides are mandatory at Aguinid falls for safety reasons, and although there is no set cost, they do deserve a reasonable tip for their hard work. In total, Aguinid falls has 8 levels, although most of the time you can only reach level 6 due to the difficulty of reaching level 8. If you have an experienced guide they may be willing to take you further, but if you want to do this then we recommend making it clear to your guide before you leave the entrance. The walk starts fairly simple as you follow a path to level 1 of the falls. There is a pool at this level, which is nice to enjoy for a short while before continuing on. Level 2 of Aguinid falls is the hardest section if you’re only going to level 6. This section involves climbing directly up a waterfall and looks extremely challenging. Fortunately, it’s not quite as hard as it looks. There are small footholds in the waterfall to make it easier to climb, and there is a rope to help pull yourself up and keep your balance. As long as you take your time, you shouldn’t have any problems – especially with your guides there doing anything they can to help! 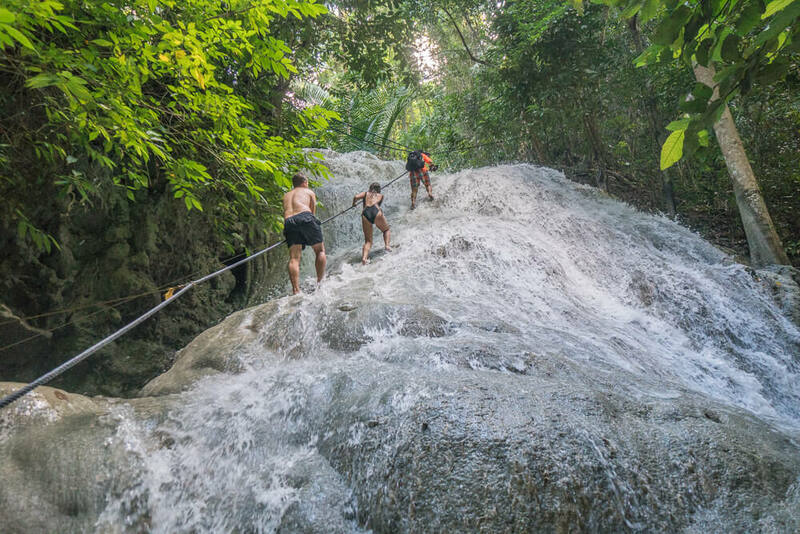 After you’ve successfully climbed the waterfall, the hardest part is over. Level 3 is relatively small, but is a nice spot to sit under the falls and enjoy a massage from the falling water. Level 4 is the final level at which you can keep all your stuff with you, unless you have a dry bag. As you climb up level 4, it’s impossible to go further whilst keeping your belongings dry, so one of the guides will wait here with your things while the other guide takes you up to level 6. Our guide was able to take one of our phones up, but we had to leave everything else behind! Level 5 is one of the most fun levels of the falls, as it’s possible to do some mini cliff jumping. The drop is only around 10 feet, but it’s good fun to jump into the pool below! Your guide will show you where to jump to land safely. Once you’ve jumped to your hearts content, it’s time to move on to Level 6 of Aguinid falls. This is one of the prettiest levels of the falls, and is the last stop for most people. There is a small pool at the base of the falls to take a swim in, which is the perfect spot to relax and enjoy the area’s natural beauty. We didn’t continue on to levels 7 and 8 as we weren’t given the option to by our guides. Regardless, the 6 levels of the falls we did visit were beautiful and definitely one of the best waterfall experiences we’ve had! 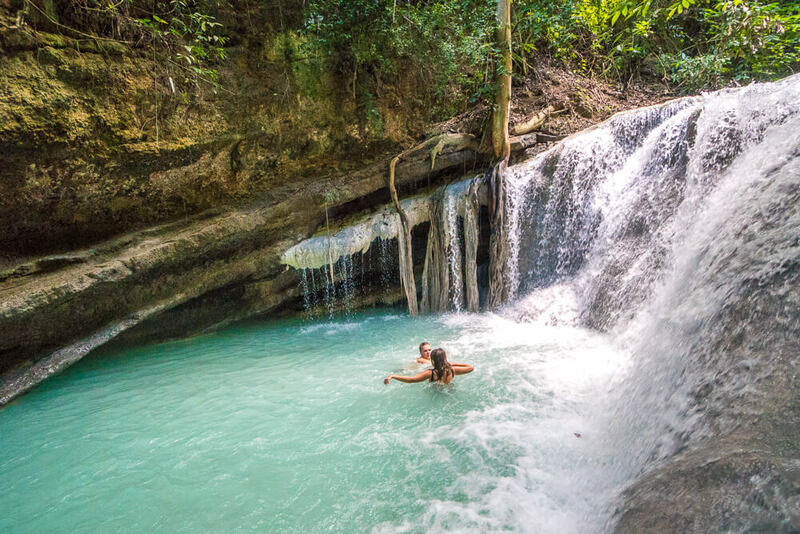 The dry season on Cebu Island runs from December to June and is the best time to visit Aguinid falls. It’s still possible to visit during the rainy season, but it may be harder to climb up due to the higher water levels. Although Aguinid falls isn’t too busy, we recommend arriving early in the day to avoid other tourists. This way you can truly enjoy the nature and take time to swim in the pools. We arrived at around 9am and were the first ones there for the day! Be generous when tipping – Although there is no set fee for the guides, be sure to leave a fair tip at the end of your visit. The guides work extremely hard to ensure your safety and to make sure you have some great pictures to go home with. Guides generally only get one group a day as the falls aren’t too busy, so we gave a tip of 500 pesos to both of our guides. If you can afford to, we’d recommend a similar amount, as it’s good value considering how helpful they are! Water shoes – As you’ll be climbing up waterfalls, water shoes are extremely useful at Aguinid falls. You can rent them at the entrance to the falls for around 50 pesos. Alternatively, make sure you have flip-flops to wear as any other shoes will get soaked if you try to climb the falls using them. Don’t carry all your stuff – Climbing up waterfalls can be pretty tough work, so make sure you aren’t carrying any extra weight. Your guides will help carry any essential stuff if necessary, but we recommend leaving any stuff you don’t need at the entrance. We were able to leave it for free at the entrance, but you may have to pay 50 pesos for a locker. Trekking only allowed until 5pm – The entrance to Aguinid falls closes at around 5pm, so don’t leave it too late to visit! Like this travel guide to Aguinid falls? Pin it!